Cradoc is proud to be a Curriculum Pioneer School. We are working with other schools across Wales to develop the new curriculum to be published in 2018, which is planned to become statutory in 2021. As a Pioneer School we meet regularly with other Pioneer Schools to discuss progress to date, undertake research and trial activities and plans. We anticipate that the trialing of activities and plans will increase as developments progress. We develop these purposes through 6 areas of learning and experience. Within these areas of learning and experience, the subjects and disciplines remain important but are not watertight compartments but rather a means of organising day-to-day activities taking place creatively at school. As a school, we work on a topic based approach, where many of the areas of learning and experience are woven together to help children make sense of their activities in a holistic way with a focus on real life situations. The six areas of learning and experience are set out below. Each area links to another page which helps to develop the curriculum further. This is currently a work in progress and we thank you for your patience whilst these are constructed. Priority has already been given to literacy and numeracy within the curriculum through the Literacy and Numeracy Framework (LNF), which is now embedded well across our work. Digital competence is a new cross curricular responsibility. 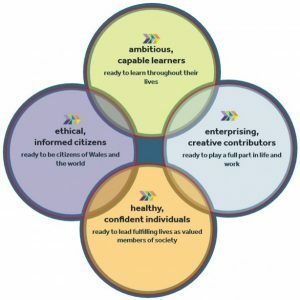 We have been working hard to improve skills and investing in appropriate technology to help us to improve in this area, and eagerly await the publication of the new digital competence framework in the Summer term. We are mindful that the history, culture and language of Wales enable our children to develop their identity and place within the world and encourage them to understand their rights under the UNCRC. As such we try to ensure that children experience both an international perspective and a Welsh dimension across the curriculum.